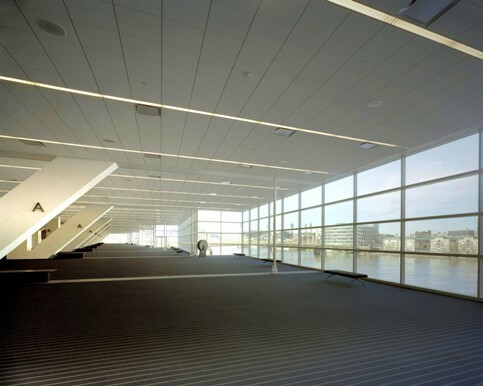 Daylighting is going mainstream and daylight harvesting, the energy-saving lighting control strategy that actually makes daylighting “sustainable,” is beginning to catch up. Of particular interest is the fact that daylight harvesting is transitioning from being something encouraged by energy programs to something required by energy codes and standards—not just California’s Title 24, but IECC 2009 and, likely, ASHRAE 90-1.2010 as well. It is likely, in fact, that in the future, most commercial buildings that have windows and skylights will be required to have some type of daylight harvesting control in the adjacent area. Green construction is emphasizing daylighting and bringing fresh attention to daylight harvesting. Energy codes are now beginning to require daylight harvesting, which will make it a future staple in construction. Photo courtesy of Leviton. 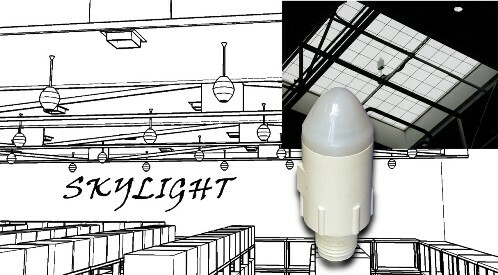 Daylight harvesting’s value proposition is fairly simple: As daylight levels increase in a space, electric light levels can be automatically reduced to maintain a target task light level and save energy. All automatic daylight harvesting control systems need a device that can measure light levels and signal a controller to dim or switch the lights in response to daylight contribution. This device is called a photosensor. The photosensor is a small device that can include a light-sensitive photocell, input optics and an electronic circuit used to convert the photocell signal into an output control signal, all within a housing and with mounting hardware. Photosensors can be mounted on walls, ceilings and as part of light fixtures. Photo courtesy of WattStopper. Photosensors may be mounted on walls, ceilings and even as a part of light fixtures. Fixture-integrated sensors may be installed as part of the original fixture or installed later in the field by attaching to a lamp via a clip and being wired directly to the ballast. The visible size of a photosensor ranges from a golf ball to a standard wall switch. As daylight harvesting grows in importance, photosensors are becoming more sophisticated. But buyer beware: There is no standard defining how photosensors should operate. When selecting a photosensor, important questions to ask about a given product include: Is it compatible with the given controller? What control method does the system use? What is the sensor’s spatial response? What range of light levels can it “see”? How accurate is its signal? Is it photopic-corrected? How far is it to be installed from its controller? How is it commissioned? How many zones can it support? What are the configuration options? Is it capable of operating reliably within the given environment—heat, cold, moisture? Are there listing or compliance requirements such as UL or ROHS? 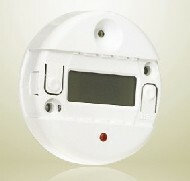 Daylight harvesting controls may be “open loop” or “closed loop” systems. Each measures the daylight contribution on the task surface differently. Dual loop is now emerging as a potentially significant technology. Closed-loop systems measure the combined contribution to light level from both daylight and the electric lighting system. 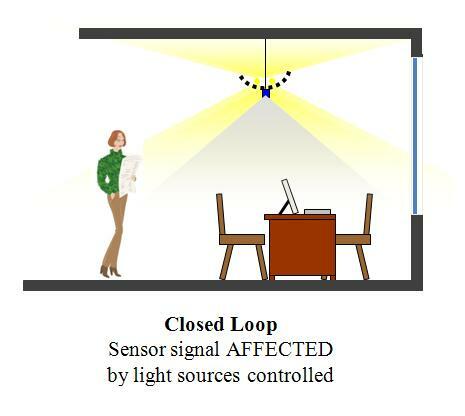 Because the photosensor measures the electric lighting system’s light output, it “sees” the results of the controller’s adjustment and may make signal further adjustments based on this feedback—creating a closed loop. 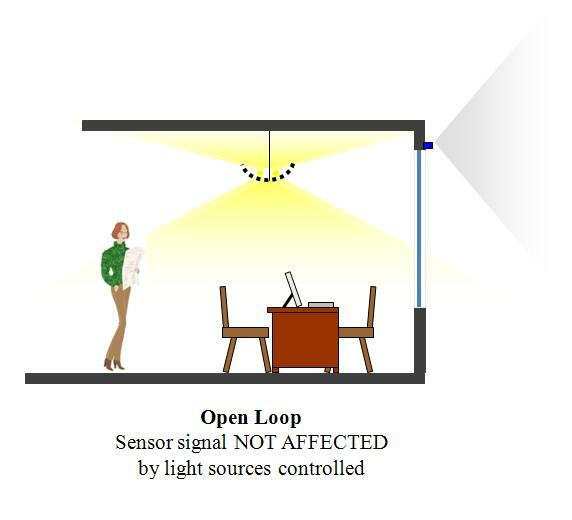 With closed loop, the photosensor measures actual light levels, so it is sometimes considered more accurate than open loop, Closed loop is considered preferable by some for applications where a specific target light level must be maintained, such as small offices. But control is limited to a single zone and the system must be properly set so that transient light level changes (e.g., white sheets of paper shuffled on and off a dark desk). do not cause overly frequent dimming or switching. 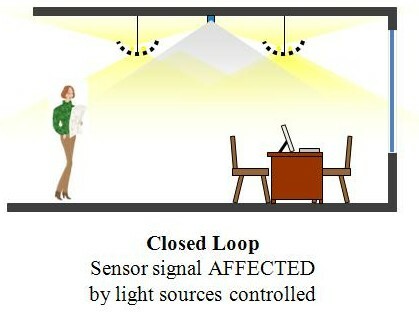 Closed-loop sensors "see" the results of their adjustment, creating a closed loop. As such, they are typically mounted on the ceiling or as part of a light fixture with a direct view of the task area, and no direct view of sunlight or light sources being controlled. Graphics courtesy of California Lighting Technology Center. Open-loop systems measure only the incoming daylight, not the contribution from the electric lighting. The photosensor should not see any electric light and therefore it is mounted outside the building or inside near a daylight aperture facing away from the controlled lighting. Because there is no feedback, it is an open loop. 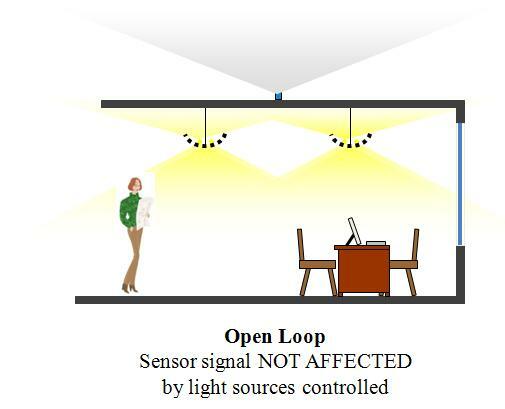 With open loop, the sensor is not affected by transient light level changes but it does not measure actual light levels. This means that a sensor placed outside a window would not know that the blinds were closed, and dim the lights inside anyway. As a result, open loop is often preferable for applications where accuracy is less important, such as hallways and atria. 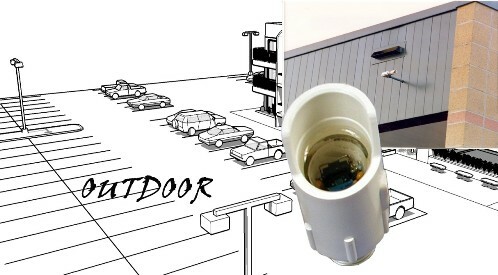 Open-loop photosensors measure only incoming daylight and therefore should be mounted inside the building near a daylight aperture facing away from the controlled lighting, or outside the building. Graphics courtesy of California Lighting Technology Center. Dual-loop photosensing is an interesting new technology that combines open-loop and closed-loop photodiodes looking in different directions. The intended result is greater accuracy than using open loop alone and greater resistance to transient light level changes than using closed loop alone. 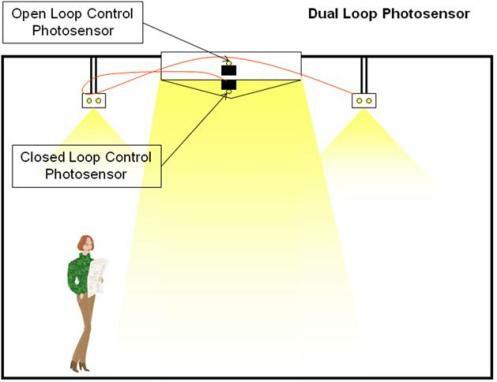 Dual-loop photosensing combines open- and closed-loop technology to increase accuracy and mitigate the impact of transient light level changes. Graphic courtesy of California Lighting Technology Center. The photosensor’s spatial response, also called its angular sensitivity, describes its sensitivity to light from different directions and defines its field of view—what it “sees,” in effect. This is determined by the design of the optical system that gathers and delivers light to it. “Spatial response is composed of two factors: the angle at which the detected light is striking the photodiode element inside the sensor, and the optics and restrictions of the photosensor housing,” says Norm Dittmann, President of PLC-Multipoint. The sensitivity of the photodiode changes with its angle—greatest when facing a light source directly and decreasing as the light moves across the sensor’s detection area. Additionally, the rings of a Fresnel lens will not allow light to enter the lens outside of its acceptance angle. 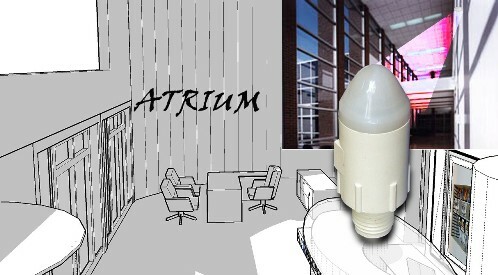 A domed sensor will blend different light sources and be able to diffuse low-angle daylight, increasing the angle at which the light can be measured by the sensor. The sensitivity of a photosensor changes with its angle. Graphic courtesy of California Lighting Technology Center. If the field of view is too broad, the photosensor may detect light where it shouldn’t, such as detecting direct sunlight near or outside a window, and thereby possibly dim the lights below what is intended. If the field of view is too narrow, the photosensor may become too sensitive to changes in brightness within a localized area, and raise or lower the lights incorrectly. “The narrower the spatial response, the more closely the photosensor responds to the luminance, or brightness, of the surface at which it is aimed,” says Trevino. 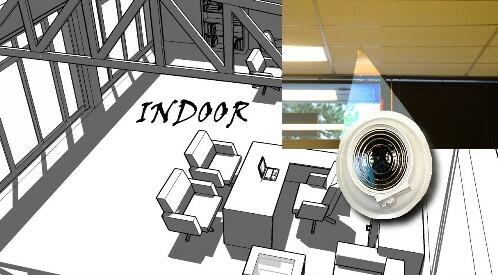 According to the New Buildings Institute, a 60-degree cone of vision is common, but Trevino points to research that suggests a 100-degree field of view for closed-loop photosensors and a 45-degree field of view for open loop. Some sensors provide an adjustable feature to block direct sunlight from the field of view. The photosensor may be limited in the range of light levels it is able to detect. Dusk and dawn lighting control is performed at less than 10 footcandles (fc), daylighted offices are controlled at less than 100 fc, atrium spaces are controlled at less than 1,000 fc, and skylight sensors see up to 10,000 fc of sunlight. 100-10,000 FC for a photosensor mounted outside a building. 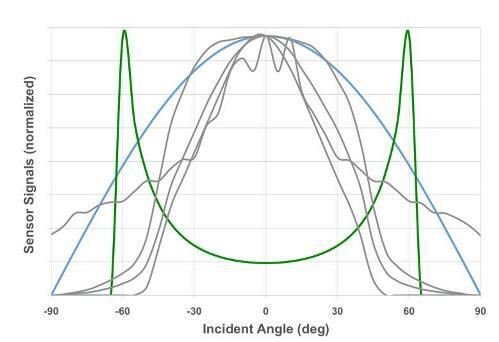 “Lighting designers should ensure that the range of response of the photosensor matches the light levels likely to be found in the area of installation,” says Solayappan Alagappan, Design Engineer for Philips. Typical light level ranges that a photosensor "sees" for some applications. Graphic courtesy of Leviton. The photosensor output signal to the controller may be a voltage or current form. As with most commercial building lighting controls, a sensor with voltage output works well when it is within 500 ft. of a controller. A sensor with current output can drive signal thousands of feet and provide better immunity to electrical noise in more rugged power environments. Signal resolution is also critical. This is the relationship between what the photosensor sees and the resulting signal output. A primary question here is whether the sensor uses a linear photodiode or nonlinear photoconductive element. Dittmann says the most important trend in photosensors in the past 3-5 years has been development of photodiode sensors that provide a linear response to light. 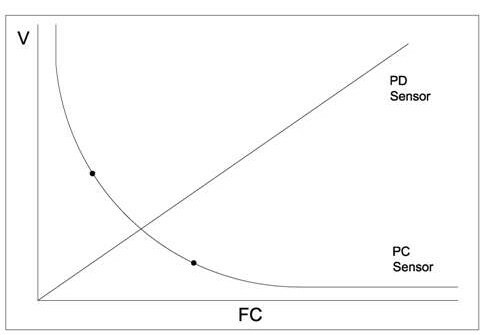 Photoconductive sensors use nonlinear sensing elements, which present a greater risk of error. Photodiodide sensors provide a linear response to light and hence greater accuracy. Graphic courtesy of PLC-Multipoint, Inc.
“Thus photosensor products are available with different range of response—illuminance ranges—to optimize signal resolution, minimize noise levels and avoid saturation,” says Alagappan. Table 1. Photosensor characteristics at a glance. Courtesy of PLC-Multipoint. The photosensor’s spectral response describes its sensitivity to optical radiation of different wavelengths. Photosensors can respond to a greater range of the electromagnetic spectrum than the visible light portion, which the human eye can see. For example, it can respond to ultraviolet and infrared radiation and thereby dim the lights unnecessarily, which can lead to occupant complaints. For this reason, filters are used to as closely as possible match the photosensor’s “eye” to the human eye. When daylight and an electric light source are mixed in the same space at different levels, the photosensor’s control algorithm should automatically undergo photopic correction. Open-loop and closed-loop proportional control algorithms can accomplish this. However, when daylight and two spectrally different types of electric lighting—such as fluorescent and incandescent—are mingled in the same space, correction is not currently possible with today’s technology. Typical mounting locations for photosensors based on application. Graphics courtesy of PLC-Multipoint, Inc. Interesting read and I really want to implement this but am having a hard time in finding photo sensors to give me the lux levels. Please mention some sensors and companies which provide such sensors.